Our monthly Affluent investor confidence indices registered a dramatic decline in January, driven in large part by market volatility since the beginning of the year. 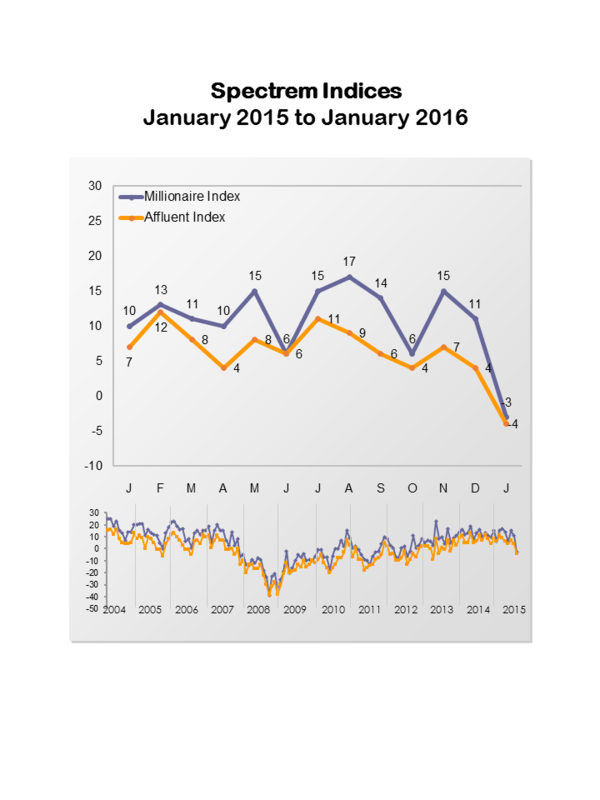 The Spectrem Millionaire Investor Confidence Index (SMICI®) was down 14 points to -3, a 38-month low. The Spectrem Affluent Investor Confidence Index (SAICI®) dropped 8 points to -4, a 27-month low. The indices measure the investment confidence and outlook of the 16MM households in America with more than $500,000 of investable assets (SAICI), and those with $1MM or more (SMICI). The SMICI is down 13-points from the same period last year, and the -3 reading marks the first time since December 2012 that the index is in negative territory. The SAICI is down 11 points from January 2015. The month-to-month declines in the indices were the highest since October 2013, the month that witnessed the 16-day government shutdown coupled with acrimonious debates over the debt ceiling and attempts to defund the fledgling Affordable Care Act. Wall Street was a key driver in the indices’ declines. The largest increase was reported by those who intend to invest in Cash. In addition, the Spectrem Affluent Household Outlook, a monthly measure of long-term confidence in financial factors that impact Affluent investors’ daily lives dropped to its lowest point since August 2013. It was down 28 points from January 2015. According to the Outlook, confidence in the economy specifically is at a 38-month low.